Download Your Free Guide to Linear Perspective Drawing Today! Take a deeper look at one of the most common types of perspective drawing: linear perspective drawing. This tutorial begins with a look at one-point perspective and drawing basics. Add even more dimension to your work using the two-point perspective technique. Then challenge yourself by adding a third vanishing point, and transitioning into three-point perspective. How to Draw Perspective: Where to Start? Perspective is the art of drawing or painting what the eye sees, in other words, making two-dimensional objects seem three. Artists use a variety of perspective drawing techniques to create the illusion of distance and depth on a flat surface including linear perspective drawing. We put together this free tutorial on linear perspective drawing techniques to help guide your perspective drawing efforts, starting with basic drawing techniques, moving onto additional angles and formations with two-point perspective, and ending with a three-point perspective overview. What better way to learn than through step-by-step drawing exercises? Whether you are a veteran at perspective drawing, or simply want to learn how to draw perspective, this free linear perspective guide is one you will turn to again and again. If you’ve ever taken a summer drive through hilly country you‘ve probably noticed that those green distant hills look pretty blue. Or if it’s fall, a distant hill may appear bluish-purple even though you know darn well it’s really yellow, red and brown. 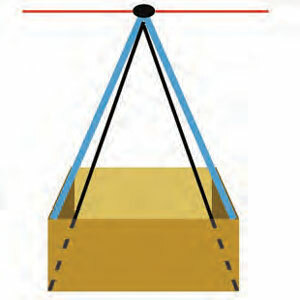 What you’re seeing is something called atmospheric perspective, or aerial perspective. Understand more about how this distance affects your perspective on color and more in your drawings. 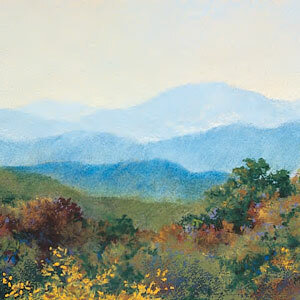 To get atmospheric effects, follow along painting demonstration that starts with a pale, fuzzy lay-in followed by a series of increasingly stronger, more distinct layers. Building a picture in this way, in stages, allows you to feel your way forward. 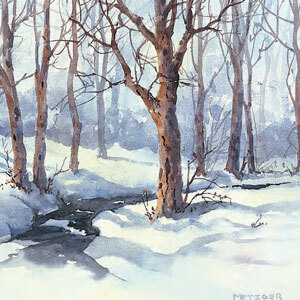 You can use this approach in any medium, but it’s particularly useful in transparent watercolor, as shown in this perspective demonstration. All linear perspective is based on the idea that parallel lines receding from you seem to meet in the distance. They do this despite the fact that they are parallel and therefore should never meet. You know the tracks are parallel, yet they meet at a point on the horizon. The tracks never really meet, of course, but they seem to. This is not so different from a row of posts or trees looking smaller and smaller as they recede. 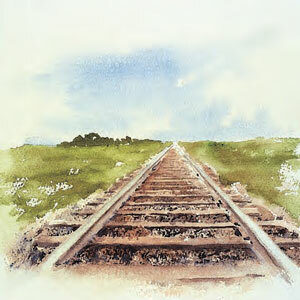 In fact, you can think of the wooden ties between the train tracks as if they were a row of posts that happen to be lying flat on the ground. Receding parallel lines converge in the distance at eye level. 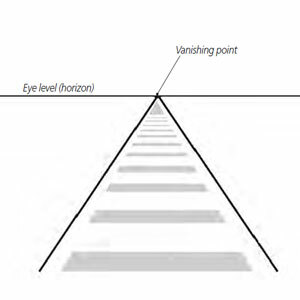 The point where they meet is called a vanishing point. In one-point perspective all receding lines meet at a single vanishing point; in two-point perspective sets of lines meet at two vanishing points. In three-point perspective, we’ll find vanishing points that are not at eye level. When you can see only one face of a rectangular box, you’re seeing it in one-point perspective. If you can see two of its faces, the box is in two-point perspective. There’s a fuzzy area where so little of a second face is visible that it’s reasonable to stick with one-point; but the truth is, that’s a two-point view. Get expert techniques in these linear perspective drawing lessons. Download this free video tutorial today and learn how to draw many different types of perspectives from drawing experts and artists. Find joy and inspiration in each segment of the free perspective drawing tutorial. Expand your knowledge of linear perspective with these free lessons and tips.